Castleton welcomes high school students to complete our coursework via two programs: Dual Enrollment Program and Early College Program. Castleton welcomes academically talented and self-motivated high school juniors and seniors to take college courses during their final two years before graduation. It is the discretion of the high school to factor the college credit course into the student’s high school GPA. It is the student’s responsibility to report any college credit courses taken to any colleges that they apply for in the future. Home-schooled students must provide two letters of recommendation, from other than family members that attest to the student’s preparedness for college-level work. All letters must confirm that the student has the prerequisite knowledge, skills, and personal traits to assure success in course work at Castleton. Speak with guidance office about enrolling in a course. Check the courses available at Castleton (1000 or 2000 level courses). Apply for a voucher. Contact Brandon Kennedy to set up a phone conversation or face to face meeting to discuss your possible fit for dual enrollment and class(es) you are hoping to enroll in. Please be aware some professors prefer to be notified in advance if you want to enroll in their course. Fill out form with guidance counselor’s signature. Your letter of recommendation and official high school transcript are required to accompany your form. Return the form with required materials to Brandon. He will be able to help with class registration. Flexible Pathways bill (Act77), Vermont's Early College Program has expanded with funds being made available to students beginning in the 2014-2015 academic year for programs that are developed and operated or overseen by one of the Vermont State Colleges, by the University of Vermont, or by an accredited private postsecondary school located in Vermont, and that is approved for operation by the Secretary. A high school junior must demonstrate college readiness as measured by academic ability and maturity. If a student falls below the traditional parameters for admission and you as a guidance counselor believe this program would benefit them, Brandon Kennedy would be more than happy to work with them. Early College applicants must have the support of their principal, college counselor, and parent or legal guardian. 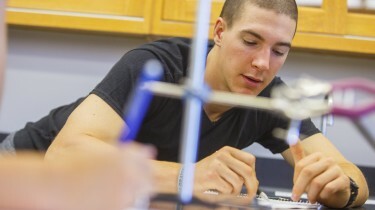 Castleton offers housing to Early College students. The student and their families will be responsible for Room and Board fees. Please feel free to contact the Admissions Office with any further questions. Early College students will participate in Castleton’s comprehensive First-Year Seminar program, which provides new students with the academic, social, and personal skills they need to succeed in college. Additionally, they will meet once a week in the “Early College Hour” to receive assistance transitioning from a high school to a college setting. Once enrolled, Early College students have the option of choosing selected majors or opting to be undecided on a major.